On November 19th, Bolivia’s Supreme Electoral Court (TSE) began the update process of the nation’s biometric voter registry, with aims of enrolling close to 300 thousand citizens before the March 29th 2015 subnational elections. During this event, nine types of department and municipal authorities will be elected. A second round will be held on March 3rd in case there is not a winner for the office of governor who has 50% of the vote or a 10% lead on his/her immediate follower. Citizens who did not register for the previous election and those turning 18 before March 29th will be able to enroll from November 19th to December 3rd. 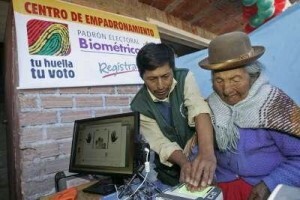 The duration of the biometric registration process will not exceed two weeks and there won’t be any extensions in the electoral calendar, informed the Vice-president of the Bolivian Supreme Electoral Court (TSE), Wilfredo Ovando. On the other hand, spokesman Ramiro Paredes stated that for this process, at least 1,450 registration points will be set up, especially in rural areas. This is meant to avoid long lines like the ones seen in May and June. In Smartmatic we are proud to have helped in 2009 with the creation of Bolivia’s first biometric registry by providing our technology and services. We surpassed (by 35%) the initial objective of 3.5 million people registered nationally and 211,092 people abroad. And we achieved this in 75 days, a speed world record when it comes to biometric registration. It is also important to highlight that the Bolivian electoral registry has today more women than men, an important step that may open the door to bigger reforms to achieve a discrimination-free society and perhaps the election of Bolivia’s first female president.